Dimensions (HxWxD): 5.75" x 1.75" x 1.5"
This rare natural, unpolished 5.75 inch long Dream Lemurian Phantom Growth Interference Wand, weighing 9.9 ounces, or 280 grams, is amazingly translucent, 95% clear in the shaft and termination tip, with a perfectly formed extremely faint phantom in the shaft and tip, too faint to see in these pictures. Hold the crystal up in front of your computer monitor and you'll see the phantom easily enough! It's gorgeous. This remarkable Dream Lemurian wand exhibits the unusual dove-gray coloration typical of these energetically powerful crystals, along with the striations typical of all varieties of Lemurian crystal. 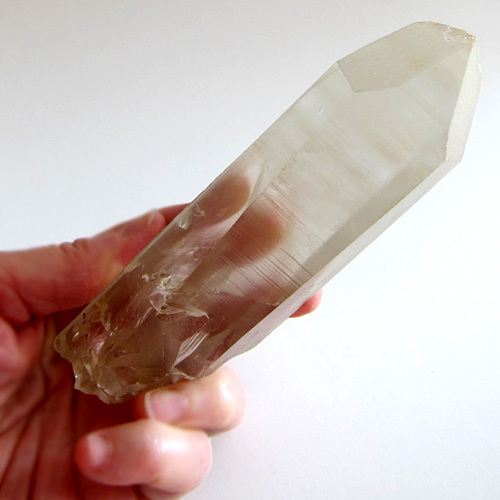 This mineralogical collector's item is also a Lightworker's power tool, and comes from one of the new Lemurian mines in Brazil from Serra do Cabral. 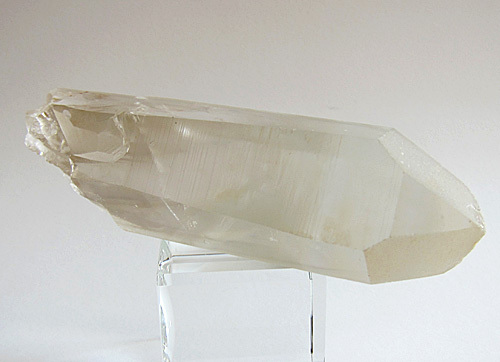 Jane and I have used the new Dream Lemurian crystals in meditation and in our Reiki practice, and we are amazed by their complex and powerful energy. During meditation and in Reiki sessions, we found that the Dream Lemurians impart a deep, nurturing warmth, most noticeable first in the “hara” center, the storehouse of Universal Life Force Energy, or “chi”, located two fingers width below the belly button. This warm glow expanded throughout our bodies, then extended out into the aura, enlivening and brightening body, heart, and spirit. We also found Dream Lemurians to be very helpful companions during sleep cycles, triggering profound dream experiences, helping us recall meaningful dream experiences, and gently triggering needed catharsis of negative emotional baggage. When relatively soft calcite formations adhere to the crystallizing quartz rhombohedron (six-sided crystal), and then the calcite deposits disappear over time as a result of weathering or fluid flows, growth interference crystals are created. 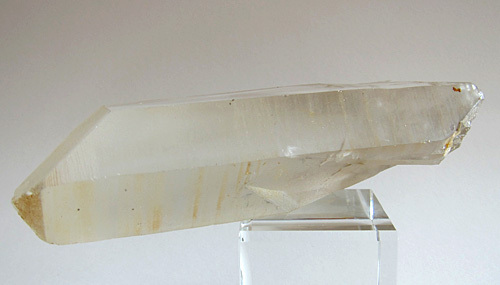 This lengthy process forms long indented grooves along the prismatic faces of the quartz crystal. Growth interference crystals are typically used to enhance understanding of blocks we encounter in our quest for emotional, physical, or spiritual growth, and to gently remove these "stuck" energies, representing old and outdated mental conceptions of the world, recurring patterns of negative behavior manifesting in relationships, negative emotional reactions to life conditions , and physical impediments to health and well-being. The growth interference crystal can be used to help remove blockages in the chakra system, facilitating the flow of Kundalini energy throughout the human energy field. Note: weight above is shipping weight. Net weight is 280 grams, .62 pounds or 9.9 oz.